Design and provide the suitable Chinese culture courses and learning programs according to your Chinese culture needs and expectations. Every month organize a variety of fun Chinese culture activities, value-adding and complimentary culture programs and cross culture activities. Provide 24-hour service of daily-life guide. Provide professional courses on Chinese musical string instruments, chess, calligraphy, painting and Chinese tea ceremony, arrange the suitable teacher for you and offer course booking services. Design and provide the suitable learning program according to your Mandarin needs and expectations. 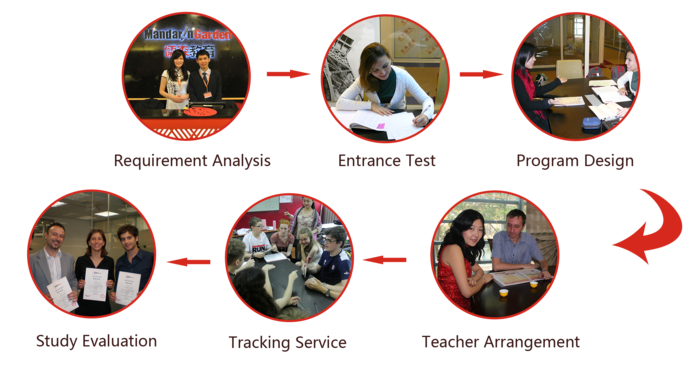 Provide the reasonable course duration, teaching location, and course appointment services. Arrange the suitable teacher according to your requirements. Provide regular term tests, study evaluation and study reports. We pay full attention to our students' achievements. When you finish the 20th hour and 40th hour of learning, our course consultants will help you fill out a survey to indicate your level of satisfaction. At Mandarin Garden, we guarantee both service and teaching quality. We will help you apply for a “Student Visa” backed by the China Education Department.